It might be finally happening. The tipping point may have arrived which leads to the end of commercial whaling. There is no humane way to kill a whale. It can take half an hour or more for a harpooned whale to die. Since the meat is not necessary for human survival, the additional notion that any animal is subjected to such a horrific end to feed a fading appetite adds another level of nonsens to this whole program. Their program has been losing money for years. The country has even diverted funds intended to help with tsunami recovery in order to help prop up the whaling program. There have been calls from around the world to end it, but Japan has resisted. I once asked Bill Clinton (while he was campaigning for Hillary in 2007) about bringing pressure to bear on Japan to end whaling. His response was that this was the one topic on which Japan was truly defensive. Japan has claimed both cultural tradition and national pride for continuing on despite diminishing returns. Australia finally threw down the gauntlet and took Japan to the UN’s International Court of Justice (ICJ). In a suit filed in 2010, Australia called out the illusion of lethal scientific research being conducted at least partly in an established sanctuary. Yesterday, the ICJ ruled against Japan’s ‘research’ whaling. The court agreed with Australia that the science program was a sham, and that Japan needed to revoke all permits and not issue new ones for any future Antarctic based whaling. Japan has initially said it will abide by the ruling and cease Antarctic whaling operation. As much as it has relied on arguments for its historical connection to whaling and disliking outside pressure to end it, the combination of factors working against the program could mean that this ruling would be a simple, perhaps even a bit of a graceful, way to bow out from that hunt. What this does NOT change is Japan’s coastal whaling, which includes the annual dolphin drives into the killing coves of Taiji. It also does not address large whale commercial whaling operations in Norway and Iceland. And, Japan could pull an about face and decide to leave the IWC altogether, which would remove it from accountability to the ICJ. In the meantime, this decision is a monumental step forward towards ending commercial whaling for good. For a clear summary of what this ruling means, check out this post from Southern Fried Science – Explainer: An end to Japan’s “scientific whaling” program in Antartica. I am pleased and humbled to have been able to contribute a little something to the post. Thanks, David Shiffman! An additional note… While their methods have been controversial, I think we also owe a debt of gratitude to the Sea Shepherd Conservation Society. Their tireless and often deeply risky pursuit of confronting the Japanese whaling fleet in the Antarctic has ensured that the world knew what was happening down there, and has helped to prevent hundreds of additional large whale deaths. “Never doubt that a small group of thoughtful citizens can change the world. Indeed it is the only thing that ever has.” – Margaret Mead. It seems fitting for this post to follow my review of Big Miracle, the film account of the rescue of three grey whales off Barrow, Alaska, up above the Arctic Circle. The conditions portrayed in the film were harsh, incredibly cold, and unrelenting. Once the ice starts and thickens, it’s there for the long haul. Getting through it or away from it is extremely difficult. And anyone who has ever watched one of those extreme fishing shows, like Deadliest Catch, knows how violent, unpredictable, and quickly changing the conditions can be in open water. So why, then, is Shell leading the charge to do offshore drilling up in that part of the world? And why are we still clinging so tightly to oil/fossil fuels that we choose to turn our eyes away and just let it happen, rather than rising up en masse and demanding clean/green energy developments that can save our planet now, before it is too late? In the last few days, I have seen several stories posted about what’s being called the world’s loneliest whale. The story, first out in 2004 from New Scientist and also covered by Andrew Rivkin at the New York Times, concerns a whale call first heard in 1989 and tracked since 1992. Theories abound about this whale. It seems that no one has seen it, or at least seen it in conjunction with its calls so that they can be conclusively connected, so its species is unknown. What’s so different about this whale’s song? Different species of whales make sounds or calls within their own range of frequencies. Fin whales’ calls are at about 20 hz. Blue whales, the largest mammals ever, call out in the 10 – 20 hertz range. 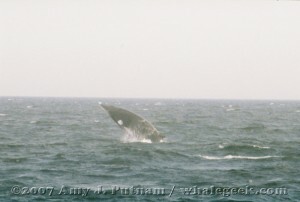 Most of us have heard the haunting sounds of humpback whales, initially made famous by recordings made by Roger Payne. Those fall in the 30 hertz to 8 kilohertz range. This unknown whale calls out at 52 hertz. Think lowest note on a tuba. Sounds pretty low, right? But if you listen to the clip here at NOAA. It’s quite different from other recorded whale sounds (you can hear samples of several whale calls on Wikipedia.) It’s comparatively a fairly high sound. There is much speculation about its origins and being lonely, unable to be heard and therefore find mates (or even ‘colleagues’?). Its migrations and travels are unlike other known whales. None of the stories mention if the calls have ever been heard in the vicinity of other active whale calls so it’s impossible to know if this whale has ever met another whale (aside from its mother), given how vast the oceans are. Perhaps somewhat ironically, that this whale has been heard at all is thanks to the US Navy’s hydrophone arrays, installed to track enemy submarines. Declassified recordings allowed the discovery of this solitary whale, as well as information about known species like blue and fin whales. As a human with a hearing loss, which results in my interactions with the world being somewhat different from most, I kinda wish I could just go give this whale a hug. And since whales are primarily acoustic animals and not visual, not being able to interact in this primary fashion is not a good thing. Whether or not this singular whale hears any others would be a fascinating question to answer, but I’d guess that if it could hear others, it might seek them out. I’m not finding any reports that this has happened, at least not when . What bothers me about most, if not all, of the stories I have seen about this whale is the constant comment that it sings at the ‘wrong’ frequency. Without knowing anything about this whale aside from the sounds it makes, wrong seems to be overstating things a bit dramatically. Better, I think, to call it a unique frequency, one never heard before by our ears (and apparently the ears of other whales currently swimming about in the Pacific Ocean). This is just another example of the many mysteries still held by our oceans. Let’s hope we have time to understand them before we kill the oceans altogether. So, good news? Sort of! Let’s start with the news that Japan has ended its Antarctic whaling season early this year! They are, of course, blaming Sea Shepherd for keeping their quota of 1000 whales down to less than 200. And yes, there have been clashes (no injuries reported). But there’s also been mounting international pressure which has to be making an impact. Not to mention the fact that there is something like 5000 tons of whale meat sitting in freezers already because the population just is not eating it. And yet, the crux of it all comes down to the defensiveness of the “don’t tell us what to eat” position. They refer to whales as “utilizable resources” (using the quotation marks themselves) as opposed to the intelligent marine mammals that most of the rest of the world sees them as, seeking their protection. If Japan had no other resources for food, zero other means for feeding their population, that position might hold more credibility. It does not. I get not wanting to be told what to eat. But this is larger than that. This is their refusal to actually learn anything from their so-called scientific research aside from, theoretically, how many whales they can kill without devastating the populations, much less learning from the massive and growing bodies of research from around the world which bolster the many reasons why whales should be protected and not eaten. Why is this all only sort of good news? There has been no permanent cessation of commercial whaling by Japan (not to mention Iceland and Norway). There is still the vicious dolphin hunting that occurs every year in Taiji, Japan. Whaling for this year might be over (including an early end to the dolphin slaughter), but the matter is still unresolved. I wish we could find a way to help Japan end these programs while also allowing it to save face culturally as it appears to desperately want. That would be a win on all sides. It seems somewhat unfathomable to me that here in 2010, this is still an open question! Yet, on the eve of what will be a critical meeting of the International Whaling Commission in Morocco beginning on June 21, the fate of whales still hangs in the balance. One thing that is maddening about this proposed compromise process is that in the last few days, numerous stories have been published that all undermine Japan’s thin veneer of legitimacy. First, there’s the whaler who has stepped forward to talk in detail, from first hand knowledge, about the pilfering and reselling of whale meat. There are the reports that Japan is bribing countries to vote with them, using not only money but entirely false arguments about the impact of (re)growing whale populations. And now, there is a story about new research – not into learning about whales but to find new ‘applications’ for whales’ bodies. And still I wonder – are these stories too late? Will there be enough momentum against sanctioned commercial whaling to make a difference? How deeply entrenched and backwards are the politics at the IWC? South Korea has indicated that if commercial whaling is restored for Japan, Norway and Iceland, it will also start to issue whaling permits. I think it is folly to think that this can truly be a controlled return to sanctioned whaling. It cannot wind up with a reduction in whale catch if other countries start killing whales as well. And while Japan is the most visible villain in this battle, this compromise also involves Norway and Iceland, whose combined whaling catch exceed Japan’s. Meanwhile new and legitimate research is producing stories all the time about whales, including a recent story about long term ‘friendships’ formed by humpback whales. A simple Google search on whale-human encounters will yield seemingly countless anecdotes which only bolster the growing theories of intelligence, sentience, and community amongst whales. These are not simple fish. There is no humane way to kill a whale. This should not even be a subject of debate any longer! Oh and I want to add – as this was pointed out to me today by the fine folks at the Whale Center of New England – this proposed compromise does NOT guarantee an end to whaling in 10 years. It merely attempts to add limits to catches over the next decade. Once that decade concludes, we could well be back at the drawing board and having to fight from scratch to end whaling. Again. So what do we do? I have sent more than one message to Obama at the White House (the guy who promised to end whaling). I will send another. Wherever you live, regardless of how your government stands on the issue, tell them you are against whaling. If your government is against whaling, the reinforcement that this is the right position is important. If it supports whaling, it needs to hear opposition. As I said, the IWC meeting starts on June 21. There are multiple avenues for tracking new from it: IWCblogger, the IWC itself, even through a Japanese site (which could be painful yet interesting for an alternate perspective). WCDS also has a Twitter feed, AllEyesonIWC, which will have information about the meeting. I’m on the edge of my seat! Stopping the slaughter – what can we do? I’ve been hearing from several friends that they are also frustrated with the current state of whaling affairs, and want to know how to help. So this post is designed to suggest some actions we can all take. It will not be exhaustive, but hopefully will prove to be a useful starting place. There are three things that are bringing attention to these matters to the fore: the death of the SeaWorld trainer, Dawn Brancheau, the recent Small Group meeting of the International Whaling Commission to discuss a fundamental shift in whaling (basically going from “banned” to permitted commercial whaling), and the Oscar win for Best Documentary to The Cove (congrats to all involved in that film!). What can we do, those of us who are not working for marine organizations or right on the front lines? At the moment, the most urgent thing we can do is to contact our government representatives. There is a serious effort being made to create a plan that allows for some commercial whaling towards the goal of ending all commercial whaling. The US is one of the countries working on this – it is critically important to increase public pressure to say that this is NOT acceptable. Killing whales on a commercial level needs to end, period. This proposed compromise simply rewards Japan, Norway and Iceland – who have been flouting the ban on whaling for decades and even increased their kill numbers – by given them legitimacy without an enforceable way to ensure that the killing DOES end. Meanwhile, thousands more whales will suffer inhumane deaths. President Obama has promised not to allow whaling – contact the White House and make sure he does not become the president who DID move towards killing whales. In the case of The Cove, which works to expose the slaughter of thousands of dolphins in Japan, you can send the text DOLPHIN to 44144. Be aware that this will place you on a text alerts list (from which you can easily opt out) and will be subject whatever text charges you have on your cell plan. Stay up on the news. If you’re on Twitter, there are loads of marine, whale and conservation groups you can follow which post stories and developments. For ideas of some, check my follow lists for oceans, whales, and green/nature. You do not have to be on Twitter to see what people are saying, and you can often find websites for organizations by clicking on their @ nicknames to reach their individual pages. Greenpeace is another organization that posts current news and offers e-petitions that can be signed and shared. These e-petitions do NOT replace direct individual contact from us to our representatives. Individual letters still hold more weight. 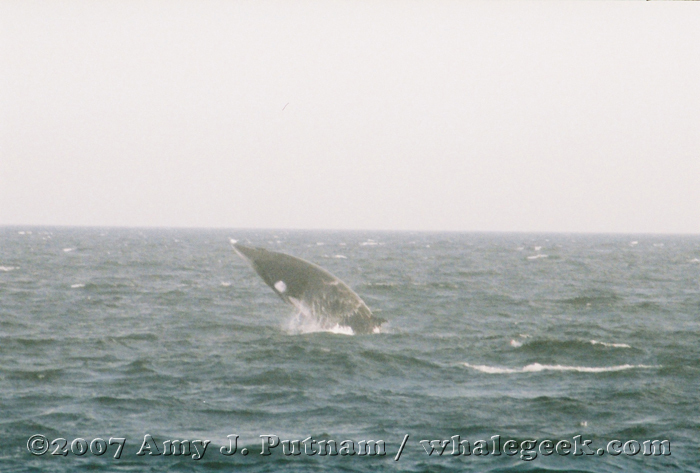 I keep a list here on the blog of whale research and conservation orgs. Again, it is not comprehensive but is a good start. Go to their sites, read up on their work, and support them however you can. In the end, there are countless matters of concern for ocean conservation: ending shark finning, establishing marine parks, ending destructive fishing methods like bottom trawling and long lining, cleaning up pollution. There are countless organizations involved in many of these causes. Use the web – find out who is working on the issues that matter to you most, and get involved. All it takes is one voice to get the ball started. First, my deepest condolences to the family, friends and colleagues of Dawn Brancheau. She was clearly a dedicated and well loved person and she will be missed by many. I’ve been following a lot of the stories and commentary about this latest incident of a captive orca’s killing a human trainer. Not surprisingly, that leads to having thoughts of my own. I used to have a strong aversion to orcas, or killer whales. When I was 9 years old, I went to see a movie called Orca, a thriller. My one enduring image from the film is of a large orca surging up onto a beach, trying to grab some human(s) there. We left the movie before it was over because it was so terrifying to us. I have also once been to SeaWorld in Florida, around the same time, and seen a killer whale show, though I don’t honestly remember much about it. I knew just about nothing about the reality of orcas. Let’s think about that sobering number for a moment. 2,000,000 – two MILLION whales – killed in the 20th century. This is probably blog post # 567,893 on this topic since the destruction of the Ady Gil in the Antarctic. The internet has been abuzz with postings: news, videos, opinion pieces all over the map. Here’s one more. The internet has been abuzz with postings: news, videos, opinion pieces all over the map. Here’s one more. If there is a good thing, as Andy Rivkin put, it, does a whale being harpooned with no witness get heard”, awareness. Bt how much awareness is happening where it counts most, in Japan? Japan is notoriously resistent to Western influence on this matter. I once commented to Bill Clinton, when Hillary was running for president, that if she won the White House, to pressure Japan to stop whaling. His response was that this was the one issue that they were really defenseive about. It’s known that the Japanese people are fairly indeiffernt to the issue of whaling. Is it that they truly do not know what is happening, how much the whales sffer in teh killing? If the Japanese people beomc more aware and more vocal about a resistance to this slaughtr, will that be the fina piece neeeded to end this cruel practice there>? And what wll it take to also end the commercial whaling by Norway and Iceland? Yes, whales need this war. Most successful movements for change are a result of a combination of approaches – the loud and visible to keep it on the radar, and the quieter efforts to effect one on one change. I sincerely hope this war does not escalate to the loss of human life on either side. I will start by saying that I’ve long had a sort of mixed feeling about the Sea Shepherd Conservation Society (SSCS). For one thing, I respect people who are willing to put their lives on the line for a matter for which they feel such passion. Because this matter is whales and their survival, it’s certainly on my radar more prominently than many other conservation concerns. And I respect that people ARE willing to go to these lengths to stop whaling. I don’t think I could make the sacrifices that they do.